Buffeted by his blackface scandal, the Virginia governor has a better chance of hanging on than anyone imagined a few days ago. RICHMOND, Va. — Ralph Northam might just hang on to his job. Left for dead a week ago after his disastrous handling of his history with blackface, the Democratic Virginia governor is quietly plotting a survival strategy. He’s conferring with sympathetic Republican lawmakers and has hired a crisis manager who’s decamped to Richmond from Washington. And as the state capitol descended into pandemonium this week after two other statewide Democrats faced their own scandals — episodes that could, ironically, help Northam’s chances of remaining in office — the governor sought counsel from pastors and worked to persuade his top staff not to bail. Northam’s work to salvage his political career represents a remarkable — and quite possibly uncharted — attempt at survival for an embattled politician. It reflects how President Donald Trump’s election after the “Access Hollywood” tape has changed the calculus for other lawmakers staring down the political abyss in 2019. 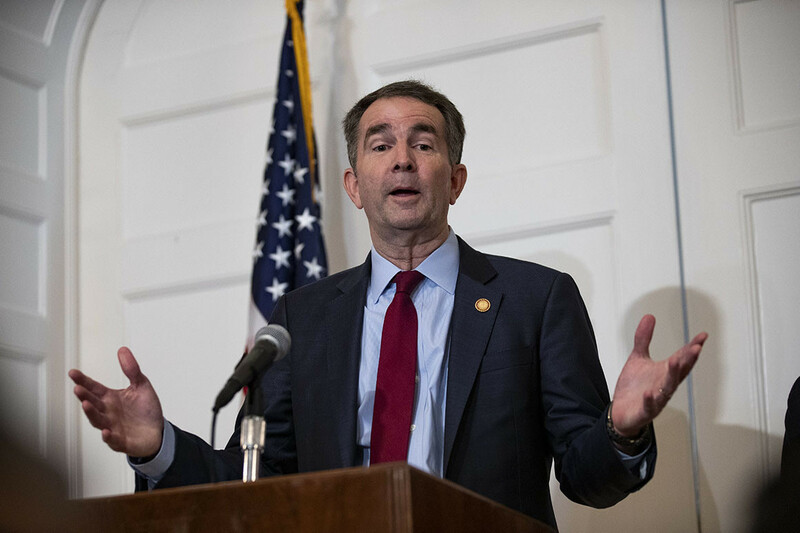 While national and state Democrats swiftly called for Northam’s resignation, half a dozen people in the state told POLITICO that the governor has no plans to leave with three years left in his term. And there’s not much they can do to make him. Northam is trying to rebuild support around Virginia. But lawmakers in his own party say they aren’t sure he can regain their trust. Virginia Sen. Tim Kaine, the former governor of the state, told reporters in Washington that Northam should not stay. “We’ve reached a conclusion and we’ve made a recommendation,” he said. The legislator said Northam needs to explain why his nickname was “coonman” when he attended Virginia Military Institute and who was in his Eastern Virginia Medical School photo if not him. Northam initially said one of the men in the picture was him — he didn’t specify whether it was the person on blackface or dressed in a Klan robe — before recanting a day later and claiming he only donned blackface for a Michael Jackson dance contest. “His behavior has been bizarre,” the legislator said. But aiding Northam’s cause is the fact that Trump has changed what constitutes a fatal political scandal. The president, on a seemingly weekly basis, has blown past controversies that might have been career-enders for politicians not long ago. Northam has spent the week in his office surrounded by a team of allies. He hired IR+Media, a Washington crisis management firm run predominately by African Americans, after it was widely recognized that the governor needed assistance from a team not based in Richmond or even in Virginia. Many of the state-based political firms have ties to Fairfax and Attorney General Mark Herring, who are in the throes of their own bids to save their jobs. In the days after the medical school photo surfaced, Northam had been receiving advice from former aides Brian Coy and David Turner, as well as Mark Bergman, who runs the governor’s political action committee. Lobbyists Marianne Radcliff, who led his transition team, and David Hallock are also assisting him, according to a half-dozen people familiar with the situation. “Everybody agreed that he needed someone who wasn’t present in Virginia, someone more professional,” said a person close to the governor. Jarvis Stewart, IR+Media’s chairman who served as chief of staff to former Rep. Harold Ford (D-Tenn.), arrived in Richmond Wednesday. Northam’s PAC is paying the firm, according to a person familiar with the arrangement. Northam also reached out to the other two top statewide lawmakers in the state, Fairfax and Herring, on the phone on Thursday. The staffs of the three leaders have been in regular contact, but Northam had not spoken to Fairfax and Herring until Thursday, when he called to tell them he was thinking of them. Fairfax has been accused of sexual assault by Vanessa Tyson, a professor at Scripps College in California. The lieutenant governor has acknowledged they had a sexual encounter but says it was consensual. Herring, meanwhile, admitted this week to wearing blackface in 1980 and apologized to lawmakers. On Thursday night, Virginia Democrats, including Sen. Mark Warner and Kaine, declined to call on Fairfax or Herring to resign in their first comments about the scandals facing them. If all three Democratic officials were to resign, the state’s government would fall in Republican hands. This week, Northam has been largely holed up in his office and has not walked next door to the Capitol, where the legislature is in session, according to multiple lawmakers. Most of the legislators he’s called or texted are Republicans who had not called for him to resign. They include Sens. Jill Holtzman Vogel, Bill Stanley and Stuart, according to several people familiar with the situation. Northam has reached out to a few legislative Democrats, including state Sen. Jennifer McClellan and Del. David Toscano, they said. Northam met with faith leaders for 45 minutes at the governor’s mansion Wednesday. He’s been in touch with pastors, including his own, according to two sources familiar with his activities. And he’s been working to persuade his cabinet secretaries not to resign. Regaining the trust of legislators is a steep charge at a moment when the national Democratic Party is grappling with issues of race and tacking to the left ahead of its own presidential primary. Other Democratic lawmakers said they would only support Northam remaining as governor if the Legislative Black Caucus, which called for his resignation, agreed. “They are the most affected by this,” a second legislator said. Northam will eventually call more Democratic legislators, a person close to the governor said. But he has been too consumed by the crisis to begin that task. “The house is still on fire,” the person said. But some say he could leave his party but remain in office as an independent. Joe Lockhart, former White House press secretary for Bill Clinton, said Northam’s refusal to let go could help him hold on. Marc Caputo and Burgess Everett contributed to this report.